Aside from the ordinary legislative procedure, there are a number of special legislative procedures that are used less often. The two most common are the Consent Procedure and Consultation. Under the consent procedure, the Commission makes a proposal which must be either rejected or accepted by the European Parliament by absolute majority. Importantly, the Parliament cannot make any amendments, it must reject or accept the proposal as it is. 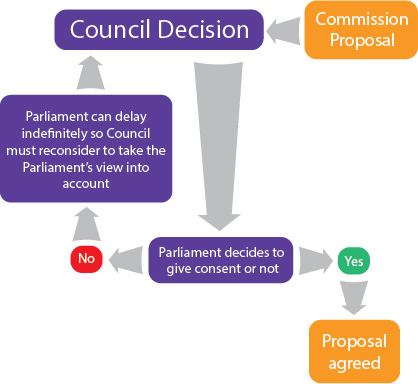 However, rejection of a proposal constitutes a veto for the Parliament, as the Council cannot take any decisions without the Parliament’s ‘consent’. While it may seem that Parliament has a straightforward accept or decline role, in reality it is slightly more nuanced, as in stating what it will reject, Parliament can often imply what it would accept. The Parliament can offer an interim report during the process to highlight what it would agree to.